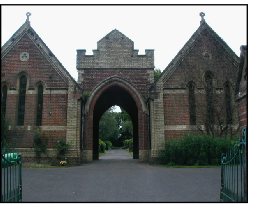 Uckfield Town Council is the burial authority for the town of Uckfield, and the cemetery is situated in Snatts Road. The cemetery has a rural location, with many mature trees and shrubs within the northern side bordered by woodland. The old section of the cemetery, on the south side, dates back to 1884 and an extension to the cemetery was opened in 1942. The original section was divided into denominations with separate areas for Church of England and Catholic burials. There is also an area set aside for children, as well as a Garden of Remembrance for cremated remains. There are 23 war graves in the cemetery for British, Canadian and Commonwealth servicemen who died in the First and Second World Wars. In 1962 the graves of two German airmen were exhumed to the German War Cemetery in Cannock Chase, Staffordshire. Although no longer in use, a brief history of the two chapels showed that the western one was originally consecrated by the Church of England, with the other chapel being for non-conformist churches. The legal effect of the consecration was removed by the Bishop of Chichester in 1999. The cemetery has well laid out pathways and taps for watering. Cans are provided and we would ask that they are returned to the water locations after use. Litter bins are provided for the disposal of litter and green waste. The cemetery is maintained by contractors and the Council's own team of grounds staff. There are strict regulations regarding burials and interments of ashes in the cemetery. Families and children are welcome to visit the cemetery, however we would stress the importance that children should be kept under supervision as some memorials could be loose or dangerous. 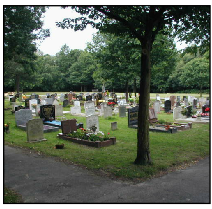 In addition to providing a service for burial and interment of ashes at the cemetery, the Council can offer a limited search of records for anyone wishing to trace the burial plot for relatives in the cemetery, and a nominal fee of £10 is charged for this service. To assist staff with the search, you are asked to supply as much information as possible, e.g., the first and second names, surnames, date of death and age. For more information on the fees and charges for burials, interments of ashes and erection of memorials, or to discuss any specific issues, or to request a search of the records, please contact the Council Offices. The churchyard at Holy Cross Church is now closed for burials, and is maintained by the Council. The grounds staff are trained in memorial safety testing and have special equipment to ensure that safety testing is carried out to strict standards. 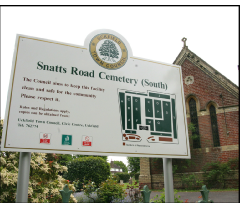 Signs are posted in the cemetery and churchyard before any testing takes place and the deed holder with responsibility for a memorial is contacted before any action is taken, except where there is an imminent danger to other visitors to the sites. Should you be a family member and would like further advice please contact the Council Offices on 01825 762 774. The newly created Garden of Remembrance is provided to give people a peaceful and pleasant area in which to mark the passing of a loved one. The Remembrance Garden has a cloistered area for the mounting of memorial plaques, this can be for loved ones interned in the Garden of Remembrance or elsewhere. The garden has extensive planting which enhances the feel of being within nature and the new path allows easy access in all weathers. The cloistered wall also provides a place to leave flowers, which will be removed once they have wilted, truly giving people a place to come to remember their loved ones at any time. Please note: On rare occasions, when a burial necessitates the re-opening of an existing grave, it may be necessary to place the excavated earth on to an adjacent grave for a short period time. The adjacent plot will be protected with a tarpaulin and immediately following the burial the earth will be back- filled and both plots left tidy. We apologise for any distress this may cause to visitors to the cemetery.